I have always loved comparing recordings. When I was younger I used to buy new (and old) recordings of the same pieces to compare with the ones already in my collection. Three works I particularly loved to search out in record stores are Bach’s Goldberg Variations, Chopin’s 24 Etudes and the Rachmaninoff 3rd Piano Concerto. Whenever I have a hankering to hear one of these masterpieces, I have my personal favorite go-to recordings—Perahia or any Schiff performance for the Goldberg (if I need a Glenn Gould fix, which isn’t frequent these days, I much prefer the 1957 live performance to the two more famous studio recordings); Louis Lortie for the Chopin (Yes, Lortie! Perfect tempi, immaculate pedaling, amazing clarity, and enormous range of musical expression. Find it and treat yourself! ); and Horacio Gutierrez for the Rach 3. As I have mentioned before, I taught a class this past semester on Rachmaninoff (and two other composers). When wanting to revisit the Rach 3 while prepping for the course, I realized that I had lent out my Gutierrez disc of the concertos. So I had to turn to one of the other recordings on my shelf: Argerich (1982 with Chailly), Ashkenazy (1971 with Previn), Tzimon Barto, Bronfman, Janis (1958 with Munch), Watts, or Rachmaninoff himself. For whatever reason, I opted for the least well-known in my collection, the Barto, the only pianist in my list above for whom I felt the need to give a first name. So I pulled out the now-out-of-print EMI label recording which has Christoph Eschenbach conducting the London Philharmonic. (I’ve always been partial to Eschenbach since I grew up watching him during his stint with the Houston Symphony Orchestra.) Barto’s tempi, I remembered, are extremely broad compared to other pianists, and his touch more delicate. I know for a fact that this is not due to Barto’s limited capabilities. I heard him perform live Prokofiev’s monstrous Second Concerto with the Houston SO (also with Eschenbach conducting), and Barto’s formidable technique more than matched the weight required by this enormous, masculine work with its two huge cadenzas. Barto himself is hulking figure—a physical specimen. At any rate, while Barto’s is not the most dazzling rendition of the Rach 3, it is one that I have always appreciated for its delicacy, clarity and vision. When most pianists plow quickly through the many dense passages at breakneck speeds, Barto plays in such a way and at such a tempo that every nearly note can be heard. You begin to hear things you didn’t realize were buried within Rachmaninoff’s rich textures. In fact, Barto plays many of the passages filled with rapid filigree as if he were playing Bach. Examples of these things later. First listen to performance of the passage taken at a tempo that represents the typical interpretation (although perhaps nothing besides the tempo can be called “typical” in this performance!). This is Horowitz’s 1978 performance with Zubin Mehta and the New York PO. Horowitz’s tempo is mm=80. Now here’s the same passage taken by Barto, whose tempo registers at mm=60!! Obviously, my immediate reaction to the Barto performance as being aberrant from the standard interpretation was not without reason. I found no performances that came even close to Barto’s tempo. 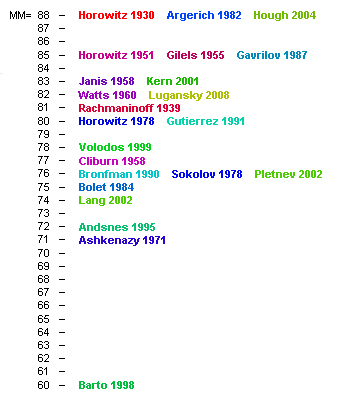 The Horowitz performance I linked above represents the median tempo of those on the chart, so for an even more drastic comparison, you might want to play the Argerich or Horowitz 1930 performance by following the links given below to compare with Barto. But what to make of Barto’s rendition, aside from the aberrant tempo? My initial reaction to the Barto was that it was all wrong! However, slowly I came around to accepting and then even appreciating his interpretation. Today, I’ve grown to love it for its daring, its clarity, its freshness, and for the fact that it truly dances! Barto plays the passage as if it were a true 3/4 waltz to be danced to rather than taking it at the skipping pace that the notated 3/8 meter perhaps implies. What are your thoughts? Below are links to the other recordings referenced in the chart, ordered by tempo. The YouTube videos (if linked) take you directly to the pertinent passage. 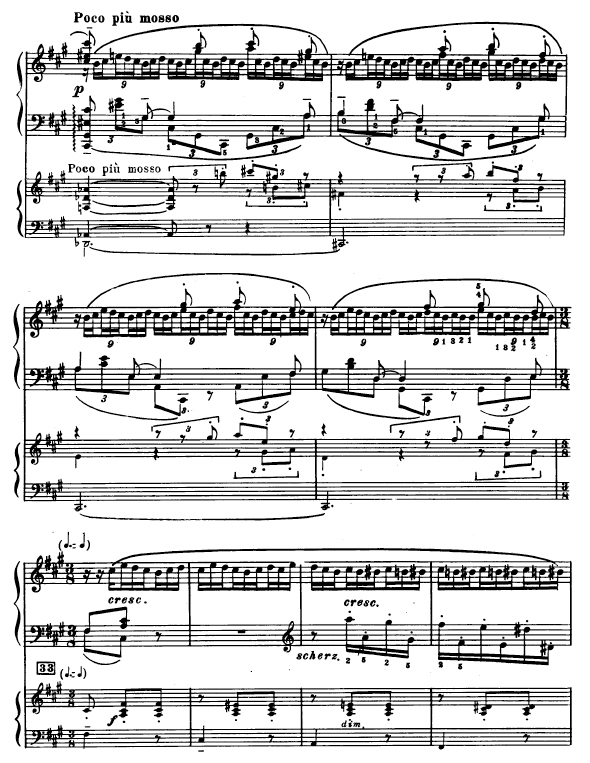 Barto tackles all such passages in the same crystalline manner, always playing with and not against or even alongside the orchestra, and always opting for a tempo that allows the soloist of any given passage, whether it be pianist or wind player, to sing the long melodic line, which is always of the greatest importance in Rachmaninoff’s music. Finally, here is one of those magnificent passages in which a small detail can elevate the music to sublimity. A relatively subdued presentation of an arch-like melody occurs in the piano. Listen then to the way in which the next phrase completely blossoms, giving the passage a sustained buoyancy and a resulting sense of jubilation! Notice again, the modest tempo allows for great clarity in the accompanying left hand and for its ability to sync perfectly with the churning strings. When I was young and first discovering this piece, I always preferred the more dazzling recordings where the pianists achieved the seemingly unachievable, tackling the densest of passages at breakneck speeds. Nowadays, I would rather listen to Barto than Janis or even Argerich. This entry was posted in Uncategorized and tagged analysis, barto, rachmaninoff, recordings. Bookmark the permalink. What a model review! I witnessed Barto performing the Rach 3 in San Francisco. He played with such strength that as the concerto progressed, his Steinway inched across the floor of the stage. I subsequently purchased his EMI recording, and for me, it’s combination of poetry and sheer force have always made it a particular favorite. As you, I love to compare recordings. our method for doing so here is exemplary. Many, many thanks. ahhh …. what’s THAT about???? Ha. I have no idea, but I think that comment needs to be deleted. At least it’s an occasion to hear from you again. Hope you are well! One of the reasons that I cancelled on-line comments to my blog. People can still reach me by e-mail. http://www.pennario.org is worth a visit. Ha! I think I may take up this challenge, though it may take me a little time. I currently have 9 recordings on my CD shelf: Perahia, Pollini, Browning, Ashkenazy, Lugansky, Lortie, Cziffra, Ohlsson and Frederic Chiu (Op.10 only). At one point I had several more on LP including Pennario and Novaes, but I don’t think I have them anymore. There are a few other recordings out there that I’ve heard but don’t own and that I would like to include in such a project: Freire, Sokolov, Abbey Simon, Gavrilov and Cortot. It wouldn’t be anything near an exhaustive list, but it would include many (most?) of the staples in the discography of complete cycles. Anyway, I’ll begin revisiting these recordings as it’s been a while since I’ve heard some of them. I do have a favorite recording, which I have a feeling will remain my favorite after this project and which I think might surprise you. But who knows. My tastes have changed over the years. few general things, The website style is perfect, the articles is really nice : D.
Thank you! Feel free to make any remarks you would like. I enjoy hearing from readers. 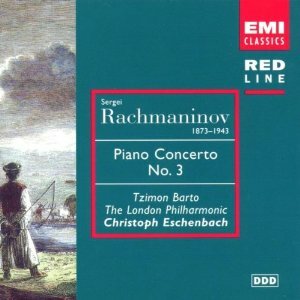 Barto is a good friend of mine, and his Rach 3rd is among my favorite recordings of the piece. In fact, only Horowitz/Coates and the 58 Cliburn get played as often out of 16 versions in my library. Barto’s 1998 Orlando concert of the Rach 3 (which may be on youtube, as I also have it on video) was magnifient–especially from the front row. Barto’s Prokofiev recording is also brilliant. and for SLOW tempos, try Barto’s Kreisleriana. He often laughs about it. but it’s remarkable. I just heard Barto playing Rach 3 in Frankfurt. I had never heard of him and so was a bit skeptical, but I found the performance to be fascinating – beautifully done. Interestingly enough, he needed the score to play it; I’ve never seen that before. I’ve heard 4 or 5 live performances of Rach 3 over here – in Frankfurt, Darmstadt and Strassburg – and besides Barto’s performance, I was most impressed with Bernd Glemser. I noticed you don’t list him, but maybe he doesn’t get over your way. I googled Barto; he doesn’t keep his site up-to-date. The last entry was in 2012. So good to read some ‘discovery reports’ about Barto’s music making. Ondine just released a new Album with Paganini Variations and the Rhapsody. While he and I share many years past, I still and always again love his exceptionally thoughtful play. Wish people would use their ears more and allow themselves to be less distracted by gossip and boring comments about bodily features. They would find Barto being consistently since 30 years one of the worlds finest piano players, a hidden American icon, an artist of the purest waters, always unique. All best to you, G.B. So glad that I am not the only one who appreciates Barto’s wildly unorthodox manner. I think he is very special, fascinating!